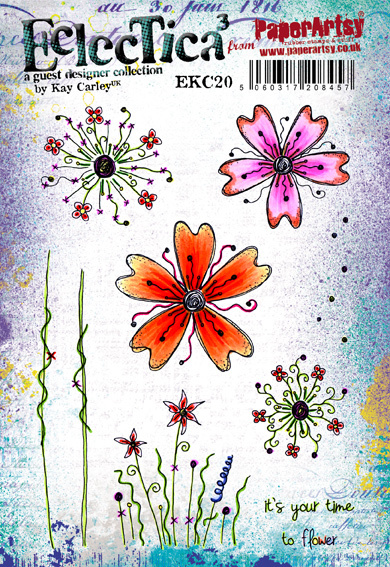 Hi everyone, Kay here to show you my newest stamps designed for PaperArtsy. Below you will find some ideas of how they can be used. 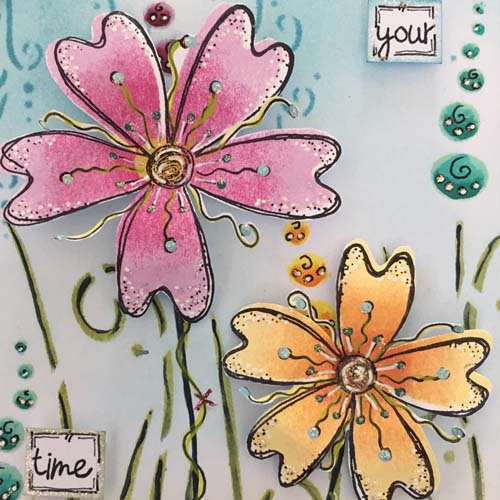 You might notice that some of my previous stamps and stencils have sneaked their way into creating these samples too! With this release I very much had in the forefront of my mind some of my previous stamp sets as these new sets were designed to mix and match with others from my collection. 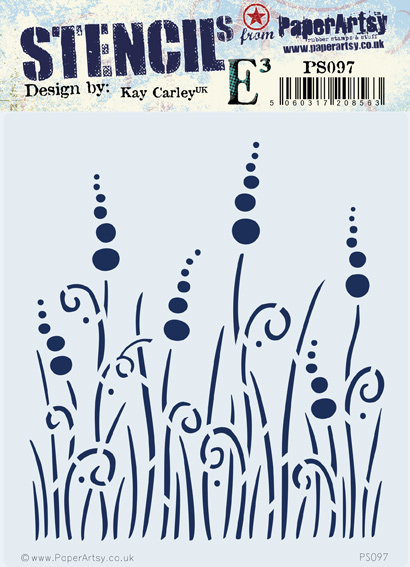 For instance EKC18 is full of delicate imagery and as such will mix very well with EKC17 (my grass stamp set) and also EKC07. Whereas EKC19 and EKC20 were designed so that they can be used with each other and with EKC13 and EKC15. This means there are lots of possibilities of mixing and matching these stamps in with previous releases. 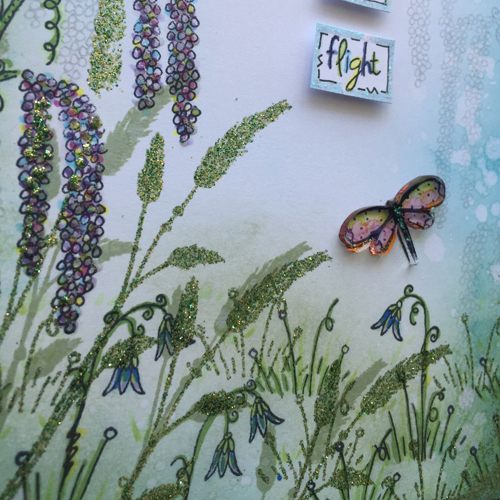 With regards to the stencils I wanted to produce bolder imagery this time around in order to 'layer' with some of my previous delicate stencils. 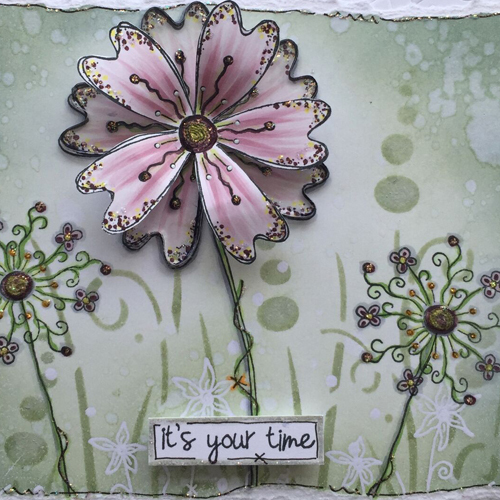 In fact let's get to it........I can't wait to show you my new stamps and stencils! There's an art sample for each new product too. 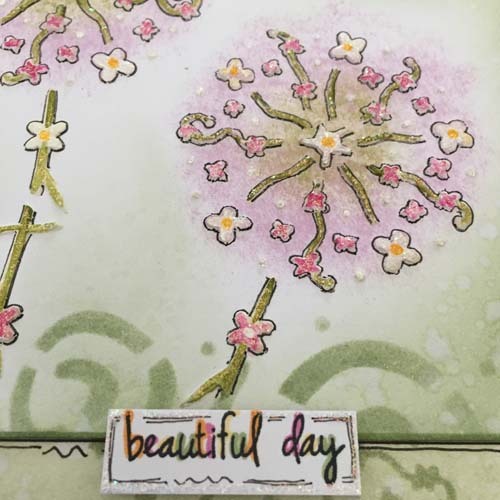 Here at PaperArtsy we manufacture red rubber stamps because we love the durability and eco-friendly nature of rubber. Rubber holds ink so beautifully allowing you to work with a variety of inks with ease, but its durability allows you to work with paint, hot UTEE and everything in between. We design, press, trim, and package all our stamps on site giving us complete control over every stage of production. 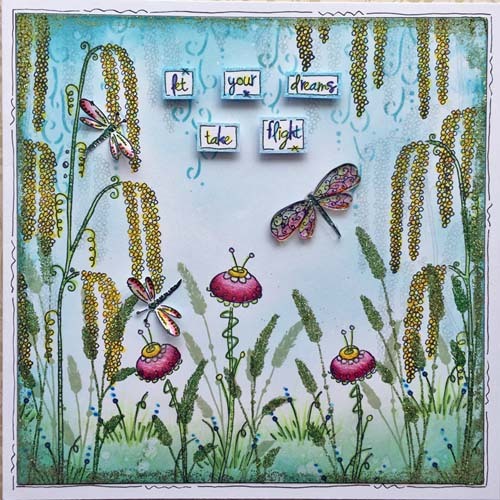 I've mixed and matched my dragonflies on this. The squiggly ones are from the new stamp set but the spotty one is from my previous EM27 mini stamp. This has been stamped onto a peek of something that may be coming your way soon!! 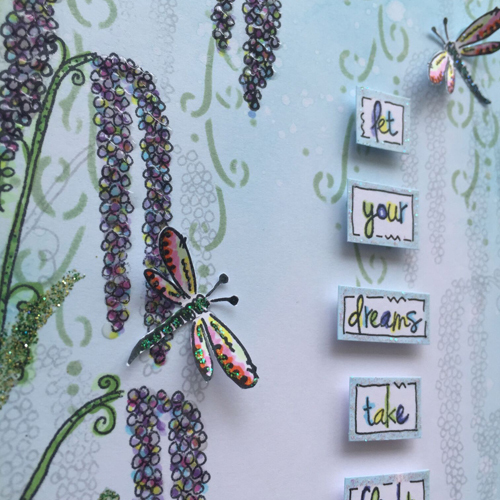 I know that I am often known for creating 'layers' when creating my samples but for this card I purposely kept it very simple to show that when you have lovely bold imagery you can create quick but effective cards. 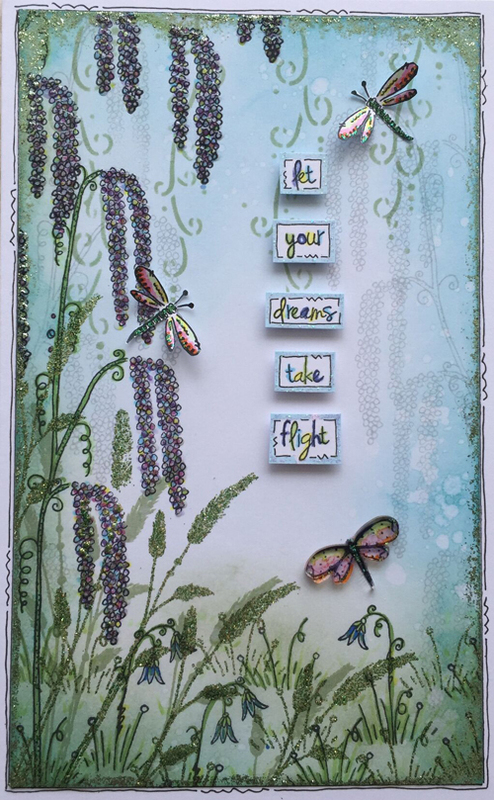 This sample goes a step further than the previous one as I've incorporated one of my new stencils to add some interest into the background. 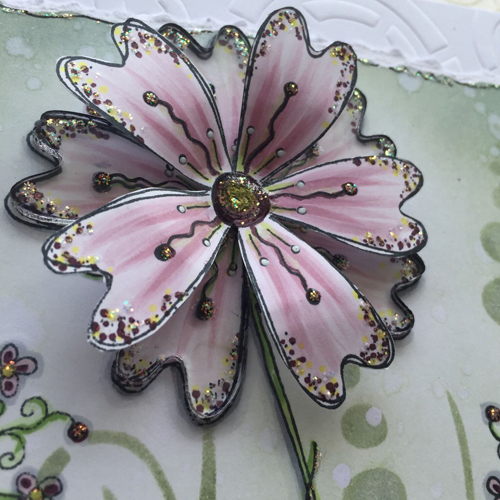 You can see that I have layered up the main flower to create a fuller looking bloom. (And if you look closely at the base flower you might see a peek of something that might be coming your way soon!! Eeekkkkk.....exciting!!) 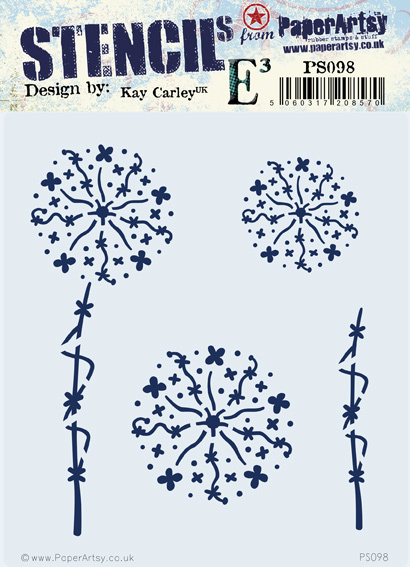 This stamp set differs slightly from EKC19 in that the flower heads and stems are separate, thus allowing the flower heads to be used on their own to stamp backgrounds etc... therefore giving more versatility. 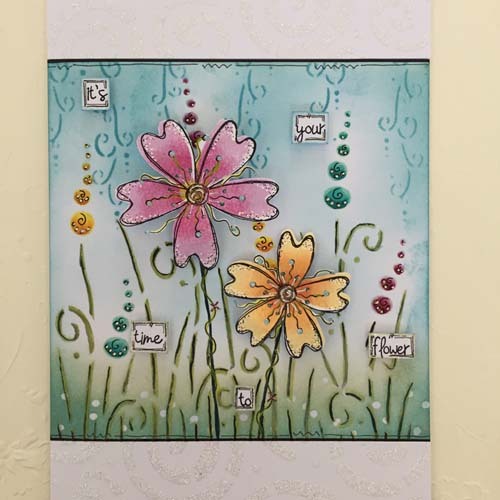 PaperArtsy stencils are made from a durable mylar which offer the perfect depth when working with pastes or texture products, and a robust product when it comes to clean up! A craft scrubbie and hot water should do the trick! 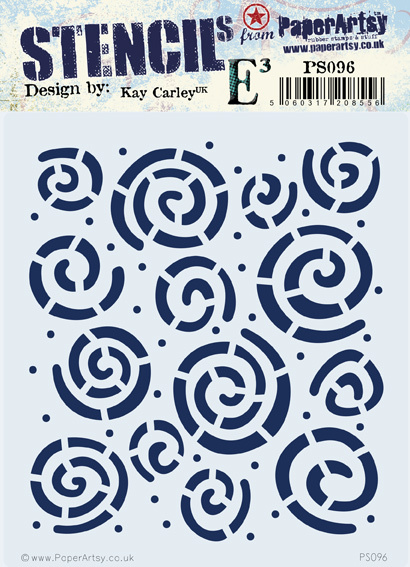 When creating this stencil I had in mind that I wanted to be able to dry emboss with it so I purposely made the swirls nice and open. 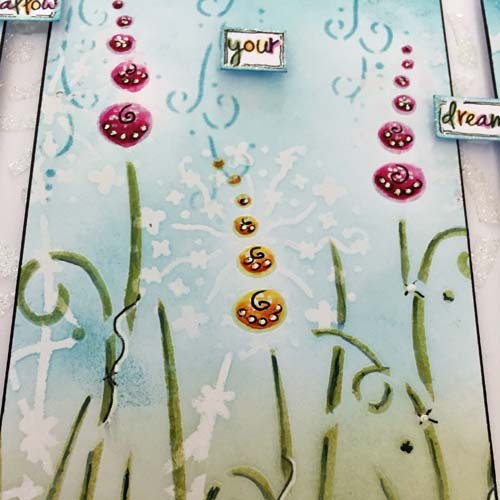 Also having bold swirls means that my delicate looking stencils from previous releases will layer on top of the swirls really well when creating 'background layers'. 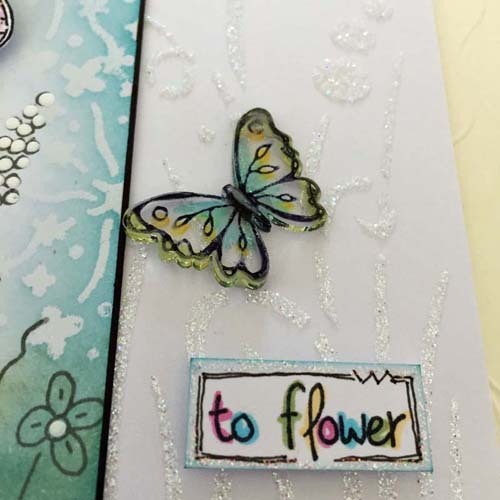 Of course it is also a great stencil to add any sort of texture paste through! (See the white borders above.) 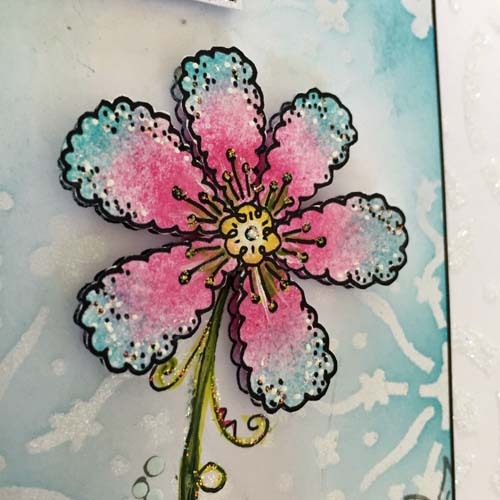 Being 'PaperArtsy's Glitter Princess' I chose to use a glittery paste - lol! The stencil was also designed so that it can be used as a border. 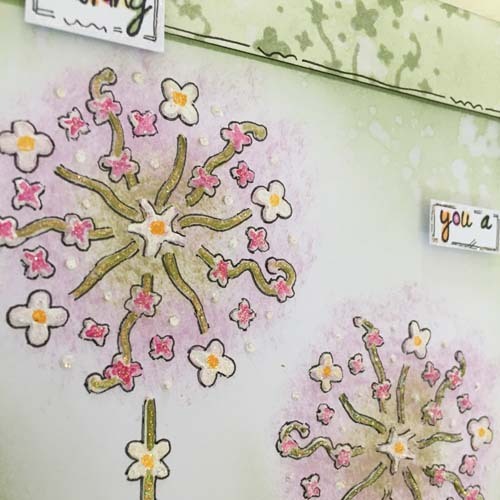 Having a 'bolder' type of stencil means that you can easily paint different colours onto your stencilled imagery and add your own doodles!!! 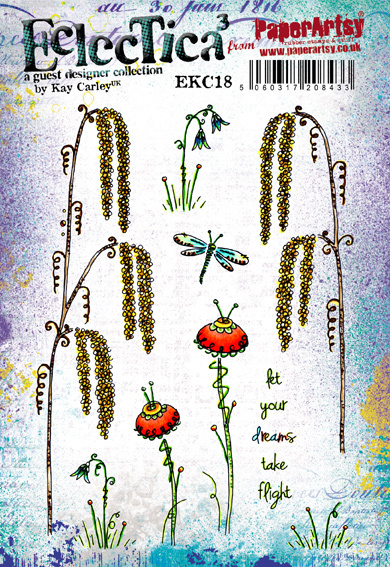 You'll see on the first image above, how I really 'layered up' using three different stencils to create this sample. The only stamped imagery are the words. 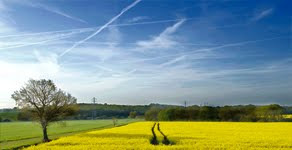 It's amazing what can be achieved just with stencils isn't it? 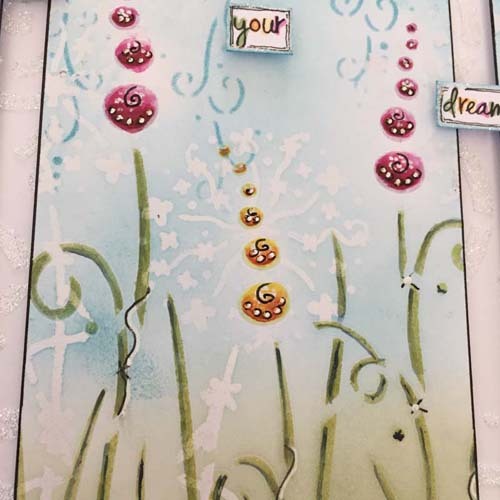 Of course this stencil is also fabulous to put any sort of texture paste through and being that the imagery is bold it is easy to apply different colours of paste to specific areas if you want to. I just kept it all one colour (above) for a clean, fresh look. 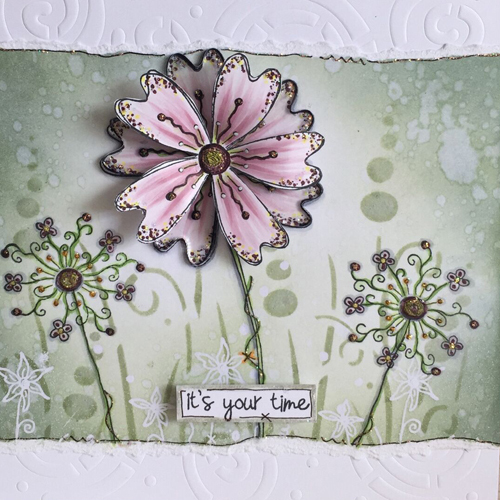 Here I've used the stencil very simply with a Distress ink but if you wanted you could have the circles a different colour to the stems and leaves or even have multi-coloured circles! I think they would look fab with Glossy Accents on them too! 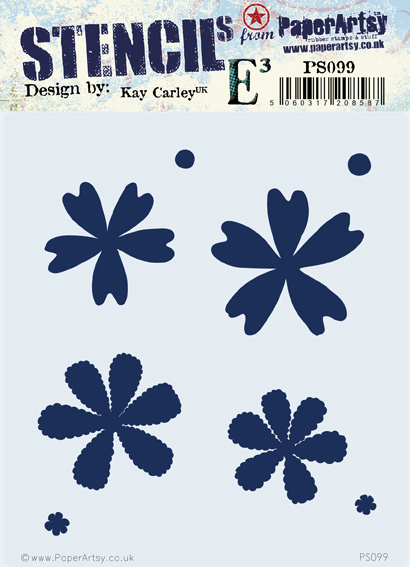 My thought process behind this stencil was to be able to mix the different sized flower heads with the two different sized stems to create lots of variation. Plus having the flower heads separate from the stems means the heads can be used on their own to create a background. 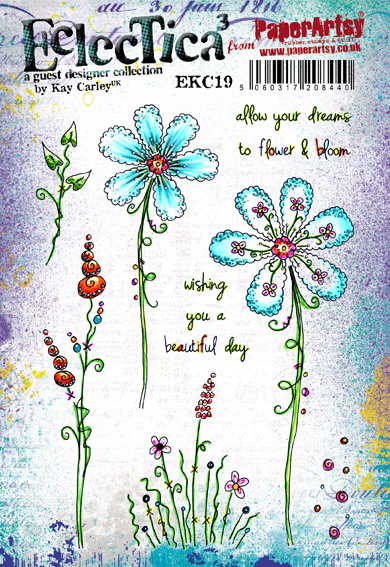 You'll see above that I used Grunge Paste with the 'complete flower' for my main imagery to create raised flowers. Once again the only stamped imagery here are the words - everything else has been achieved with the stencils. 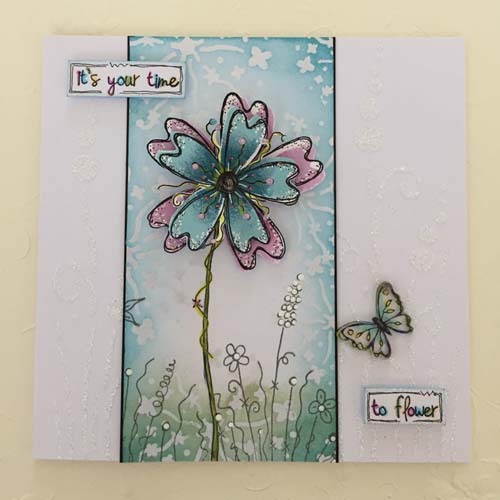 In the background of this sample you can see I have used the smaller flower head and stem to create soft background imagery. 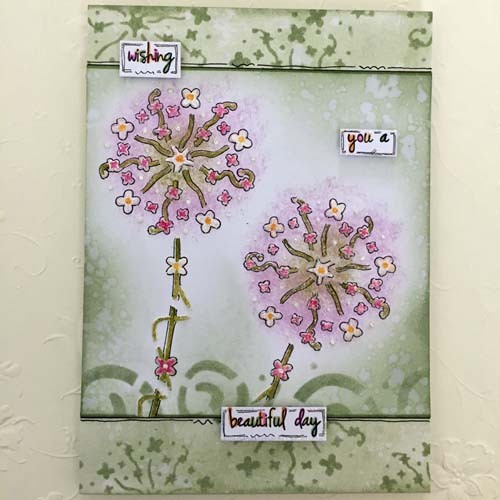 This shows how you can use several of those stamps from EKC18 to create a flower filled garden setting. I have added grasses from EKC17 to add depth to the foreground and stamped extra imagery of the 'weeping' flowers' in light grey to add subtle interest to the background. The large dragonfly 'flew in' from EM27! 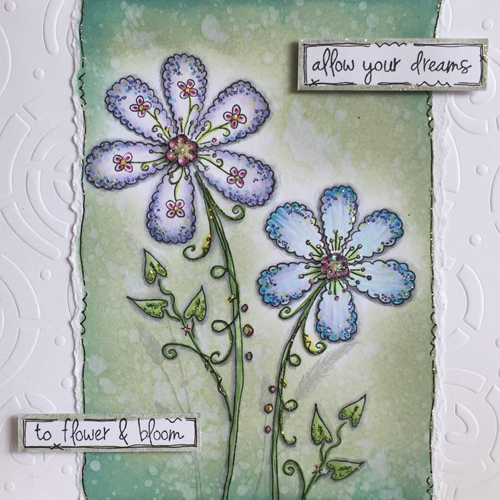 This card is made up of the 'supporting imagery' from EKC19 and I love the delicate nature this creates. 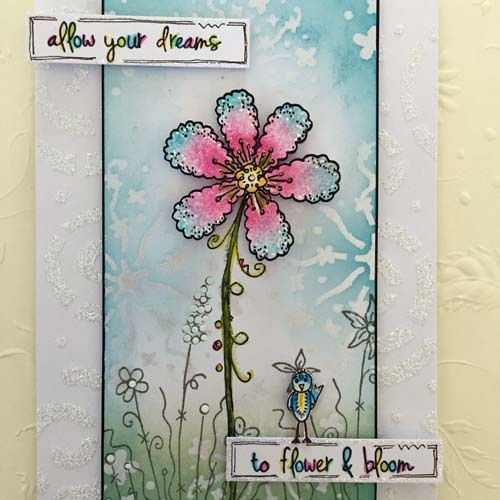 With this card I wanted to make a 'statement bloom' using the flowers from EKC20 and then kept everything else pared back to allow the bloom to take centre stage. 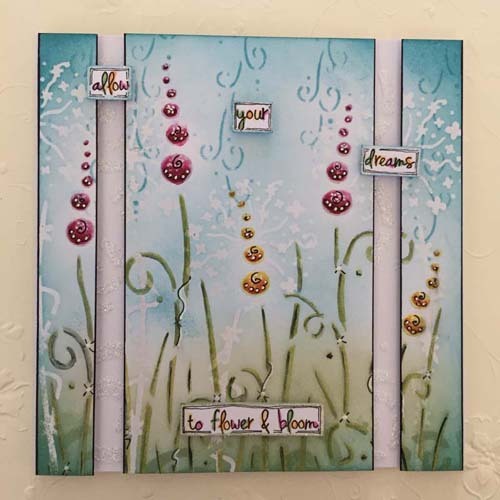 I really hope that this has given you some inspiration as to how these stamps and stencils can be used. As you will have noticed I chose to give all of these cards a lovely clean, fresh feel by incorporating a lot of 'white'. There also might just be a little bit of glitter here and there too! 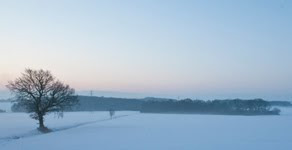 But of course these images will lend themselves to other looks too. 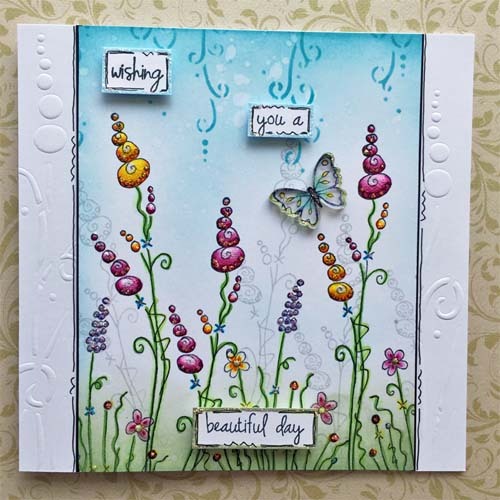 Gorgeous stamps and stencils Kay!!! Congratulations! I cannot wait to try some of your amazing ideas! 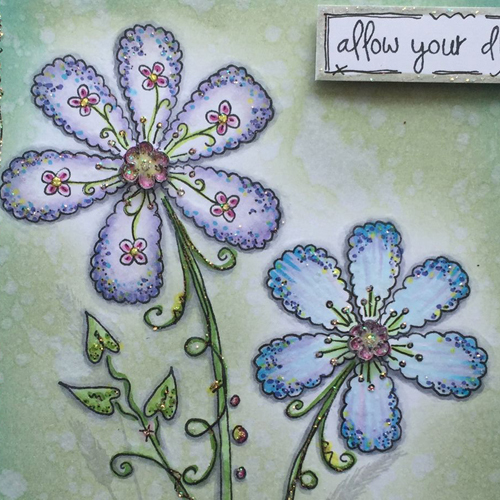 Love how those stencils all work to make brilliant layers! You are too clever for words!!! ~ Leandra ! And those secret things too.....love! Thanks Kay and Paperartsy - my Wish List is now HUGE!! !